Have you noticed tiny hard white, yellowish or skin-colored bumps under your eyes? Do you consider them to be acne or persistent pimples? Well, they’re simply syringomas. Does that sound scary? There’s no need to be scared or intimidated because syringomas are harmless. Syringoma is a non-cancerous tumor that forms in the ducts of the sweat glands. It is formed as a result of an overgrowth of cells within the ducts of sweat glands. The cells clog and enlarge the ducts, and form tiny hard bumps. The visible bump is only half of the syringoma. The other half lies below the surface of the skin. Syringomas are harmless. Unfortunately, there is nothing you can do on your own to banish these tiny bumps. Steaming or squeezing will irritate and most probably scar your skin without getting rid of the syringomas. Over-the-counter creams for syringomas are available. These will most probably not be effective in the short term or long term, and may have undesirable side effects such as formation of deep craters that won’t heal on their own. The best thing to do is to see a dermatologist or a physician. Excision: This involves the use of scissors, scalpel or flexible razor blade to cut and take out the syringomas. Bichloroacetic acid (BCA): This involves application of BCA to the tip of each syringoma. It causes a brief burning sensation, and crusting over of the bumps. The crust falls off in a period of 7-10 days, leaving no bump, hole or permanent discoloration. Electrodessication and curettage: This involves scraping down the syringomas followed by electrodessication which dries the affected areas using electric current. The two techniques are repeated up to the point where the normal skin area is clear. Electrocautery: This involves burning away of the syringomas using a probe with an electric current. Usually, the first session only destroys the part of the syringomas that lie above the skin. A number of sessions are required to remove the entire syringomas. Overtreatment of the syringomas using this method may leave tiny holes or dark spots. Dermabrasion: This involves the use of a diamond-tipped pen to rub out the surface of the syringoma till it flattens. Cryosurgery: This involves freezing with liquid nitrogen or another subzero substance. Carbon dioxide laser treatment: This involves the use of laser to kill the tumor cells. 50% trichloroacetic acid may be applied after the laser treatment. This treatment is effective in getting rid of deep-seated syringoma cells and minimizing side effects such as scarring. The cost of treatment varies depending on the technique, doctor and location. Treatment is considered to be cosmetic therefore you shouldn’t expect your insurance to cover the costs. 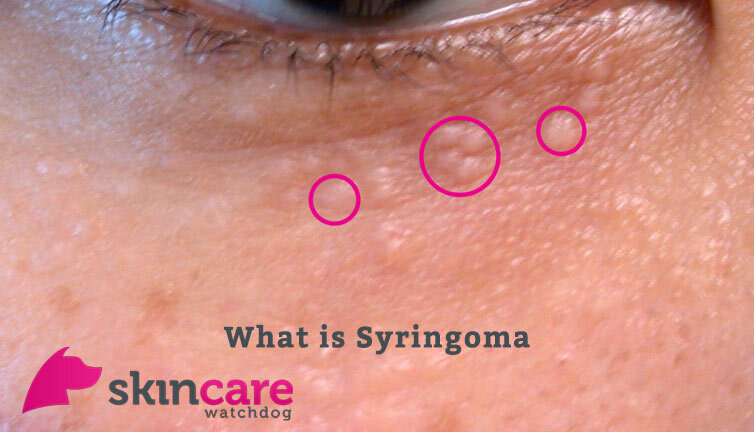 A point to note is that syringomas are embedded within the dermis. As a result, compete removal is often successful. Recurrence is very much a possibility.